or maybe the kitchen sink tap before the hot water starts to get hot and flow through the tap. the water meter, but also your energy bill will be far more than it needs to be. without wasting endless amounts of cold water and all at a very low running cost. cooled water back to the water heater via the cold water pipes, NOT a drop is wasted. 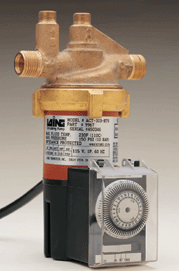 The pump turns off when it sensors hot water. You get INSTANT hot water at every tap. water on tap all the time. installed underneath the sink and requires only a single power point to operate. heater, this pressure reducing valve must be moved back to before the cold water take-off. 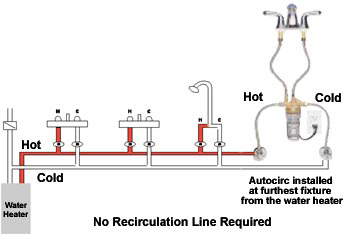 Autocirc requires that both the hot and cold water pipes in the house be at the same pressure. and through a check valve, until the hot water again reaches the pump. More suited to new homes and requires a dedicated return line. home a mere 90c to run per month. than 1 light bulb and you have the pleasure of hot water when you turn on any tap. Having hot water on tap helps all around the house in many ways. The dishwasher will not need to heat the water. You can fill the jug with hot water and get a cup of coffee quicker and cheaper. This all saves you on your electricity bill by using your cheaper off peak electricity to heat water. On gas it’s even more economical. 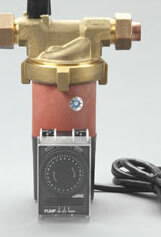 Flo-Rite Plumbing Pty Ltd is an agent for Autocirc, Ultracirc and SM Laing pumps for Brisbane and the Gold Coast areas.